Châteauesque (or Francis I style, or in Canada, the Château Style) is a revival architectural style based on the French Renaissance architecture of the monumental French country houses (châteaux) built in the Loire Valley from the late fifteenth century to the early seventeenth century. The term châteauesque (literally, "château-like") is credited (by historian Marcus Whiffen) to American architectural historian Bainbridge Bunting although it can be found in publications that pre-date Bunting's birth. As of 2011, the Getty Research Institute's Art & Architecture Thesaurus includes both "Château Style" and "Châteauesque", with the former being the preferred term for North America. The style frequently features buildings incongruously ornamented by the elaborate towers, spires, and steeply-pitched roofs of sixteenth century châteaux, themselves influenced by late Gothic and Italian Renaissance architecture. Despite their French ornamentation, as a revival style, buildings in the châteauesque style do not attempt to completely emulate a French château. Châteauesque buildings are typically built on an asymmetrical plan with a roof-line broken in several places and a facade composed of advancing and receding planes. The style was popularized in the United States by Richard Morris Hunt. Hunt, the first American architect to study at the École des Beaux-Arts in Paris, designed residences, including those for the Vanderbilt family, during the 1870s, 1880s and 1890s. A relatively rare style in the United States, its presence was concentrated in the Northeast, although isolated examples can be found in nearly all parts of the country. It was mostly employed for residences of the extremely wealthy, although it was occasionally used for public buildings. The first building in this style in Canada was the 1887 Quebec City Armoury. Many of Canada's grand railway hotels were built in the Châteauesque style, with other buildings mainly public or residential. The style may be associated with Canadian architecture because these grand hotels are prominent landmarks in major cities across the country and in certain national parks. In Hungary, Arthur Meinig built numerous country houses in the Loire Valley style, the earliest being Andrássy Castle in Tiszadob, 1885–1890, and the grandest being Károlyi Castle in Nagykároly (Carei), 1893–1895. The style began to fade after the turn of the 20th century and was largely absent from new construction by the 1930s. William K. Vanderbilt residence, Petit Chateau, 1878–82, Manhattan, by Richard Morris Hunt. 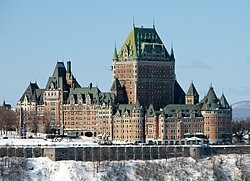 Many of the Châteauesque-style buildings in Canada were built by railway companies, and their respective hotel divisions. They include Canadian National Railway and Canadian National Hotels, Canadian Pacific Railway and Canadian Pacific Hotels, and the Grand Trunk Railway. ^ a b Whiffen, Marcus, American Architecture Since 1780: A guide to the styles, The MIT Press, Cambridge, MA, 1969, p. 142. ^ Maitland, Hucker and Ricketts, A Guide to Canadian Architectural Styles, Broadview Press, Peterborough, Ont., 1992, p. 93. ^ a b McAlester, Virginia & Lee (1996). A Field Guide to American Houses. New York: Alfred A. Knopf. p. 375. ISBN 0-394-73969-8. ^ Stein, Susan R., ed., The Architecture of Richard Morris Hunt, University of Chicago Press, Chicago IL, 1986, p. 151. ^ Maitland, Hucker and Ricketts, A Guide to Canadian Architectural Styles, Broadview Press, Peterborough, Ont., 1992, p. 94. ^ Craven, Wayne (2009). Gilded Mansions: Grand Architecture and High Society. New York: W. W. Norton & Company. pp. 111–126. ISBN 978-0-393067-54-5. Wikimedia Commons has media related to Châteauesque architecture. Ci.chi.il.us: Châteauesque style guide — images from Chicago architecture. Oldlouisville.com: Châteauesque homes in Louisville — images from Louisville, Kentucky.